Copper is a pretty valuable metal in the electrical industry. It is used in various forms and is utilized in quite a wide variety of applications. It has several beneficial features such as resistance to corrosion, malleability, and ductility. It is also a great conductor of heat and electricity. Copper wires come in two types – solid and stranded or bunched. In a solid wire, there is just one single strand or core of wire. It can be bare or be surrounded by a non-conductive insulator. These wires do not bend easily since they are rigid. They are usually installed in low-flex, permanent, applications, such as magnet wire in transformers and motors, house electrical wiring, or wires for breadboards. 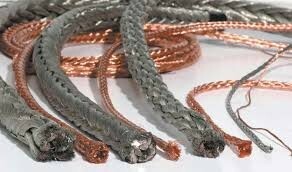 Stranded wires are a group of small gauge wires that are compressed and twisted or braided together. They too are coated with a non-conductive material. They are wound together in half-frame arcs, semi-concentric, and concentric loops. This allows the wire to retain its properties, along with saving inventory space. They can be looped around an ion rod or a wooden one- depending upon the nature of the application. In the same cross-section, a stranded wire would be much more flexible and easier to install than a large solid one. It is a lot more tolerant of strain and, in fact, the more it is bent, the harder it becomes. The most typical uses of stranded copper wire is in speaker wires, automotive wires, appliance cables, headphone cables, etc. Many Copper Wire Manufacturers offer optimized Bunched Copper Wire for electrical and industrial purposes. This is because these are extremely popular in these fields on the back of features such as reliability and flexibility. They are used as connectors due to their strength. Since they are kinks-free, they are used as ropes to tie knots as well. They are easier to rout. Many high-frequency applications, proximity effect is more severe than skin effect, and in some limited cases, simple stranded wire can reduce proximity effect. For better performance at high frequencies, which has the individual strands insulated and twisted in special patterns, may be used.